Gratitude is the big word now. So if Santa forgets to bring you the new Mercedes tonight, well then cheer up and give thanks for the gift that keeps on giving. Mourneabbey will know what I'm on about. The Cork ladies team from near enough Mallow won the All-Ireland senior club championship after losing three out of the last four finals. Up until now Mourneabbey had to take consolation from the glory and valour of the journey. But the destination flashed by like a train speeding past the station you were meant to get off at. They stuck at it and a series of events brought this intrepid group even closer together. Mourneabbey is the club of Karen Buckley, who was murdered in Scotland in 2015. I have little doubt that the Mourneabbey players were thinking of their player who died so tragically. I had this feeling Karen's grace was shining from heaven on her native place. I hope her family will get through this Christmas without their daughter who was so loved. They can take some consolation from the influence Karen has had on this country club, where the belief never left even in the darkest hours of defeat. The GAA can sometimes pull communities apart but the footballers of Mourneabbey brought their home-places together. We have often written here of Anna Browne, the little Mourneabbey kid who will run full pelt to check the tree this Christmas. Anna had an operation in America and now she can kick the ball again without falling. She is some determined girl. Anna was given Jonathan Sexton's Grand Slam-winning boots and the €25,500 raised helped fund her medical treatment. Anna was the Mourneabbey mascot for the Munster final this year and the team have drawn inspiration from her fighting spirit and the story of how a family fought for their daughter and sister. Mourneabbey gave their all in the final against a brave Foxrock Cabinteely side. The game was played in Parnell Park. Even in the ladies game all finals are played in Dublin. But Mourneabbey weren't going to lose, so they have given hope to Mayo, who know more than most about journeys not reaching their chosen destinations. But Mayo actually know how to go about beating Dublin. The execution may be the most difficult part but they must take comfort from near misses, rather than look back in anger or with sadness. St Senan's from near me won the North Kerry Championship for the first time in the 83 years of the competition. Robert Barry lost the use of his legs after an accident when he was cutting firewood. Barry is St Senan's. His service goes back over 40 years. St Senan's didn't even have a pitch until Robert took over as chairman. I wrote about him here a few years back. He told me then his big plan was to get on to the sideline for a game, any game. 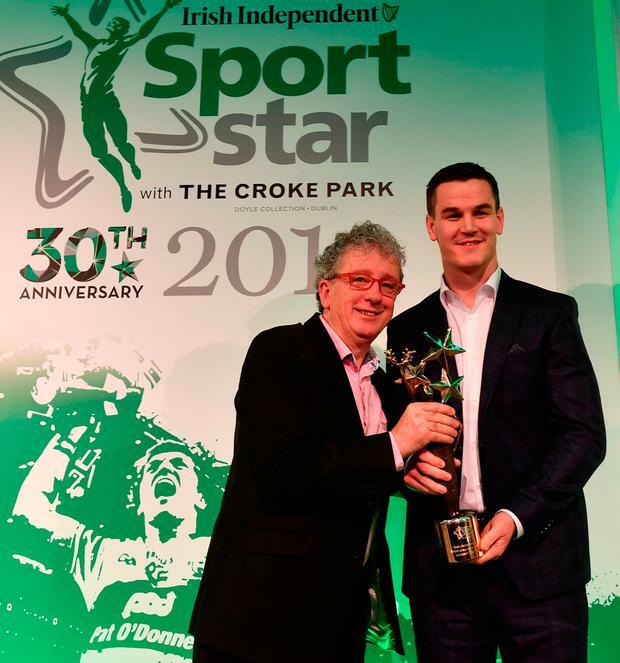 I had the great honour to present the Irish Independent Sports Star of the Year to Jonathan Sexton on Thursday last but there were days when he too went through tough times. A very young Jonathan was substituted at half-time by Leinster against Castres just after he missed a kick right in front of the posts. But he battled on. That's the secret really, the not giving up. But it's not easy and I know there are so many people reading this who go through terrible loneliness around this time of the year. I managed to get the Christmas tree up, the crib and a few decorations upstairs over the bar where we lived as a family. It can be tough walking up those steps when there's no one there to greet you at Christmas. But somehow we have to smile and think of the happy days, and the happy days to come. We owe those who came before us that much, at least. The making of each and every one of us is miracle in itself. And the best way to pay back our lost loved ones is to keep on going the best we can. There's this man who calls to see us every summer. He is Irish American and a recovering alcoholic. Like so many Irish Americans, he is more Irish than most of us here at home. My friend is spiritual and has devoted his life to helping others. He sends on inspirational quotes. 'Worriers and those going through their share suffer most at night'. 'Tonight is the loveliest or the toughest night of the year'. "At night our fear is strong, but in the morning in the light, we feel our courage again." These words were spoken by Malala Yousafzai, the youngest ever recipient of the Nobel Peace Prize. Malala was shot by the Taliban because she advocated the education of young girls. You may well ask what's all this doing in a sports column? I'm just off the phone after a chat with Robert Barry. Here's what he's looking forward to most. Robert is saving up the watching of Paudie Herlihy's excellent video of the game until the house is quiet, and he can go through every minute without interruption. And yes Robert did make the sideline for the final. The deeds of small places like Mourneabbey, St Senan's and many more show us all that if we hoor it out, as my mom used to say, well then the morning light Malala spoke about will shine through. Happy Christmas, and happy every other day too, to each and every one of you.